My Thought Orchard: Have You Been Obducted? 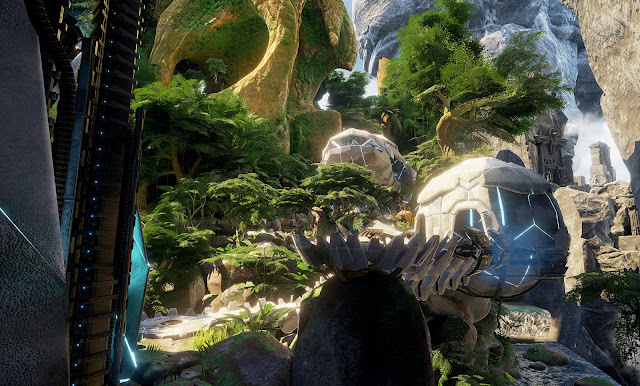 Alicia and I beat the game Obduction on Wednesday, and had a ton of fun doing it. 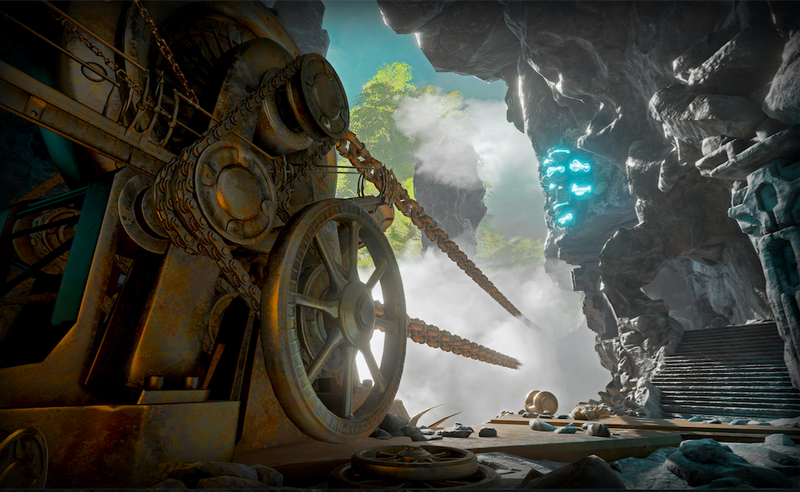 Obduction is a puzzle game in an alien landscape. It turns out Alicia is better at finding clues than I am, which works out fine because I like solving puzzles using less information. On the flip side, when the puzzles get tedious Alicia is happy to let someone else do the “click until your hand goes away” part. And as fun as the game is by itself, it was especially fun to do it together. As you may remember, the creators of Myst and Riven used Kickstarter to fund development of a new game. You can imagine that I was excited, having loved that series and played each game at least twice. So, I backed the kickstarter project and had fun searching for clues in a mini treasure hunt, using codes from their kickstarter videos to find a chain of webpages with a countdown clock and hints about the game’s premise. Then I got to sit back and anticipate it for two years while they actually made the game. With each title the company has released, Cyan has tried hard to push the boundaries of computer graphics and of game design. Myst was revolutionary and not only remained the top selling computer game for 17 years, but also helped to make CD drives a common feature of home computers. Riven was a huge step forward in graphics. (Back when Cyan Worlds was preparing to release Riven, some of the developers came to Albuquerque to give a presentation, and Dad and I got to attend to learn about their exciting new techniques in computer graphics. When the game came out we were all impressed with the beautiful realism of the scenery.) Myst V used a free-roam rather than point-and-click interface. 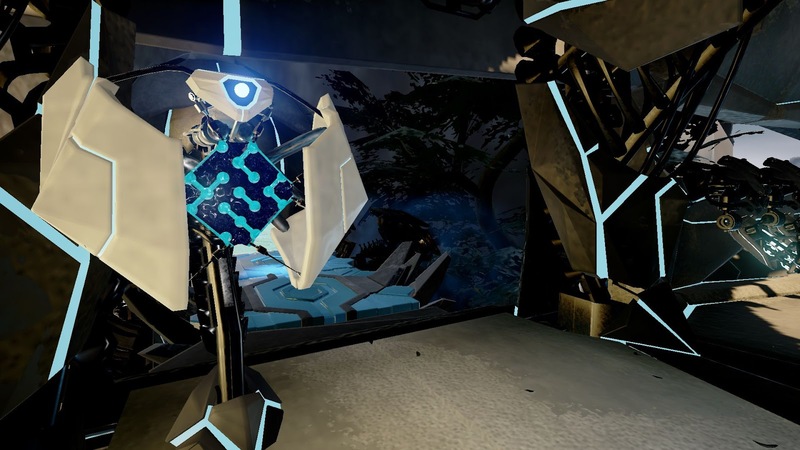 URU did as well, and attempted to create a social and interactive experience where you could collaborate with other players to solve puzzles online. That part fell short of their vision, since the audience wasn’t large enough to support it financially, but fan-hosted servers still keep the game running and a small and welcoming community is regularly online. The company decided to push at the graphics again, to create an immersive world that could be experienced in virtual reality. However, since you can now move and look anywhere you want, (as compared to Riven’s point and click movement, the graphics can no longer be pre-rendered on a supercomputer. Now your home computer needs to do all of the calculations to figure out what you see. That means that to experience the fancy, high-end graphics of Obduction, you need a fancy, high-end computer yourself. When the game was released, my laptop couldn’t even open it. While neither Alicia’s laptop nor the new one I bought on Black Friday meet the minimum specs for the game (it calls for a dedicated graphics card), they are able to run it if we use the lowest graphics settings. 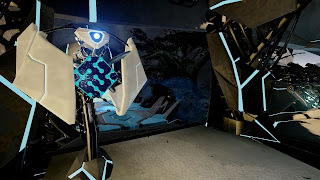 Which is to say that I can’t comment on the newfangled boundary-pushing graphics and VR experience, only on the puzzles and story of the game itself. Fortunately, those are the pieces that I love and that Cyan does well. On those fronts, Obduction delivers. 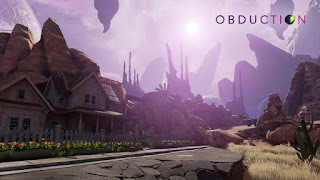 “Obduction” is a term from plate tectonics, describing one plate going on top of another one, and the game certainly involves things being covered or hidden. The name also clearly borrows from “abduction” of the Roswell variety, since the opening scene involves you getting teleported away from earth by a glowing space pinecone. 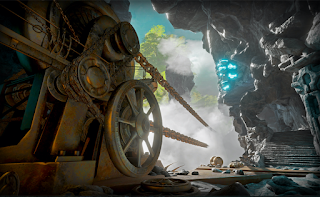 As with past Cyan games, Obduction features imaginative locations to explore, lots of locked doors to open, and puzzles that are largely integrated into the landscape. That last point makes the puzzles feel less arbitrary, and one strength of Obduction is that the story gives a reason for all of the barriers that stand in your way. 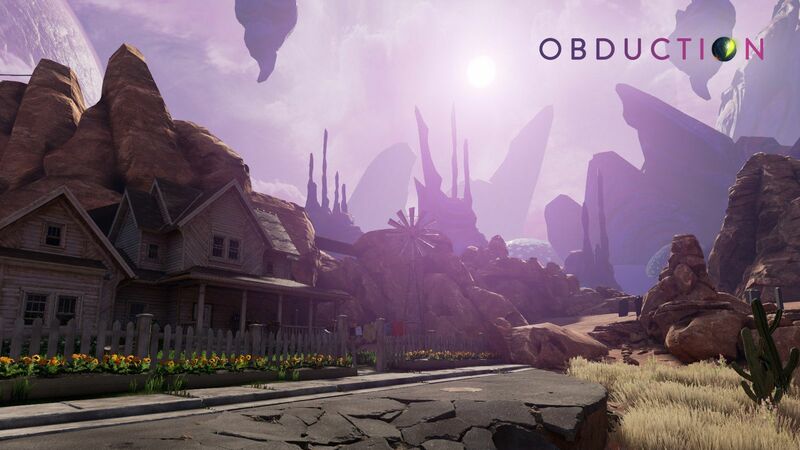 As a whole, Obduction is easier than Riven, but pretty similar difficulty to the later Myst entries (possibly easier if you use all of the in-game clues). This brings us to my favorite part of the game: the new number system. In Riven, the game taught you a base 5 number system that you had to use in several puzzles throughout the Myst franchise. In Obduction there is a new numbering system, and understanding it allows you to input the correct patterns on panels like these. Easily my favorite puzzle in Obduction, I spent nearly an hour playing with the panels and figuring out how everything worked together. It was supremely satisfying. Apparently, that area is one of the first you are supposed to get to, prior to traveling to any of the other worlds. But, though I’m embarrassed to have missed such an obvious thing, I’m glad I did. Once we rode down the elevator we found a sheet of paper explaining exactly how the alien number system worked, next to a machine for interconverting between their system and ours. When they hand you the solution like that, what’s the fun of solving a puzzle? Regardless, I think Alicia and I make a pretty good team. Together we solved the whole game in either 16 or 30 hours of play time, depending on how you measure. The game was running on our computers for 30 hours, but only 16 of that was spent actually wandering the landscape and fiddling with switches. Specifically, that excludes the time we spent waiting for the game to load as you move between areas or teleport between worlds. On a better computer that time should be reduced dramatically, but for our non-gaming laptops there was apparently a lot to think about. Usually that loading period wasn’t too much of a drag, because you can take a quick sandwich break and then come back to a new world to explore. But there is a series of puzzles called The Gauntlet that requires a minimum of 11 round-trip teleports between worlds, and that assumes you know your goal and take the most efficient route. When we did it the first time we took almost 40 (I got us off to a particularly bad start). So if you have the option to play Obduction on a machine that won’t choke on the graphics, you will likely enjoy a much more streamlined experience. As an added benefit, you will probably also get to see some of the higher resolution graphics that Cyan put so much work into. In general, Obduction has fewer codes to solve and more paths to connect. At two separate points in the game I found myself amazed that the designers had managed to pack so much into an apparently small space, and the thrill of opening a door into a whole new set of subterranean tunnels reminded me of discovering the many interconnected walkways on Rhem. The tradeoff is that when you use that type of puzzle, it means a lot of walking. You unlock a door, push a button, then have to backtrack to the other side of the level to find an elevator that is now in the right place. 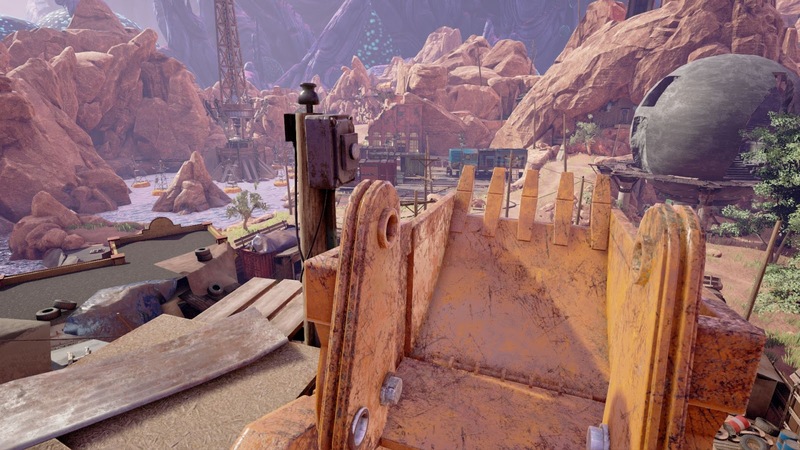 Obduction sidesteps some of this by adding more shortcuts as you solve more puzzles, but finding an efficient route still requires you know where you want to go and what the next step will be. When Alicia and I were in the exploration phase of the game, we made multiple long walks through a world (or two) to get to the piece that was now in position. For comparison, when I replayed the game and tried to be a little more efficient with loading screens and walking (and no longer needed to explore), I finished in a leisurely 5 hours (2 hours actual play time). 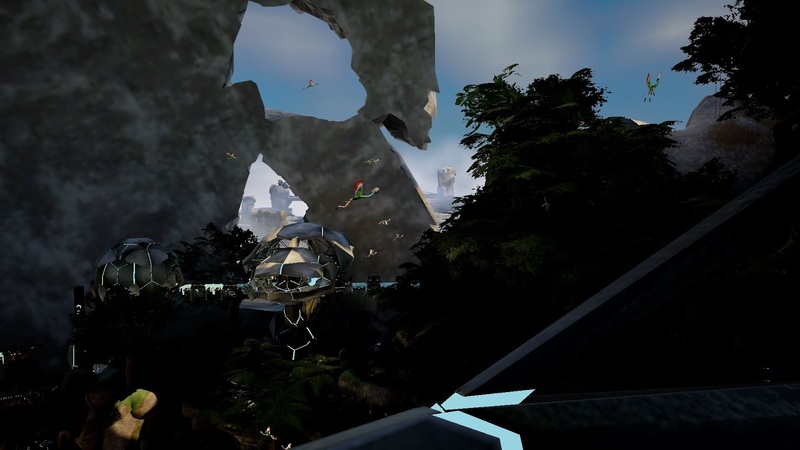 Final verdict: You should give Obduction a try. I am glad Cyan made another game, and I hope they continue to produce such excellent, puzzling worlds, though I wish you didn’t need a high-end gaming rig to take advantage of what they have done. I am glad that I got to play it with Alicia, and I hope we can find another puzzle with prominent buttons to ignore. You two do you sound like a great team! And thanks for the Cyan background. I hadn't thought about gaming as such a push in computer capabilities before.